I posted the trailer for this film back in 2012 because I like cats and the idea was quirky enough to catch my attention. Soon, other cat lovers were commenting on the post and it still gets visitors to this day. In 2012/3, the film toured film festivals around the world (like Berlin) and made its way to the Edinburgh International Film Festival. Thanks to this, the film is available on the Edinburgh Filmhouse player, a treasure-trove of indie and foreign titles which can be streamed for a low price. 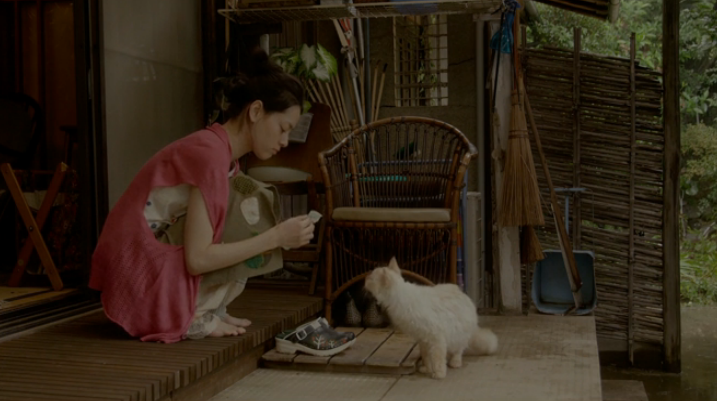 Some titles like Shun Li and the Poet, and What Maisie Knew are on DVD in the UK but some like Rent-a-Cat would probably not make the transition to physical distribution because its delights are subtle. 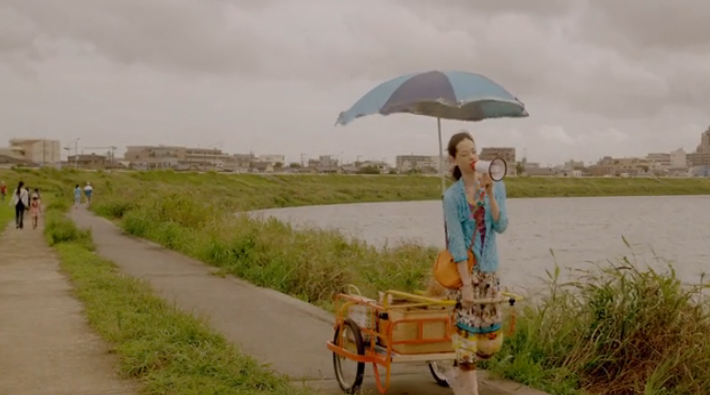 Writer and director Naoko Ogigami has crafted a deceptive film. It is billed as a comedy but is rarely laugh out loud funny. 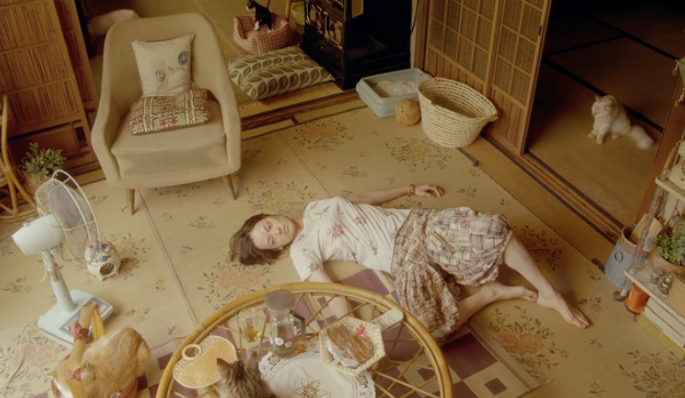 She has split her film into a series of vignettes with Sayoko’s story acting as a frame. Most of the stories are familiar and simple and the pace is gentle and languid with a level of quirkiness that is layered over stories of profound loneliness. Each vignette begins with Sayoko pottering about her home before she traipses along the riverbank with her cats, calling out to other lonely people who soon take her up on her offer of feline companionship. The customers range from a widow with a negligent son who wants a companion to break the loneliness, a businessman (the fantastic Ken Mitsuishi who was in Noriko’s Dinner Table) who finds more love from a cat than he does from his wife and daughter and a lonely woman at a little used rental car store who has little contact with anybody and spends all her time alone. These are all specimens of a highly atomised society where people are too timid to strike out and make friends or tell the people close to them what they feel, the sort of recognisable people we might pass without a second thought but all yearning for human contact. Each person is wracked by insecurities and loneliness that contact with a cat can cure or assuage and help them move on with their lives. Then we retreat back to Sayoko’s house. The stories are subtle and often bittersweet, although very familiar and easily resolved. The lightning rod of each sequence is Sayoko who comes with her cats to lighten lives and with her quirky behaviour, provides a lot of the comedy and proved to be the most interesting. The more time we spend with her and in her home, the more we appreciate her. The focal point of her home is a shrine. It has been two years since her beloved Grandma passed away and Sayoko is battling a lonely hole in her own heart. Such is her loneliness that she makes wall-scrolls with characters proclaiming, “This year I’ll get married.” She has a deeply caring relationship with her cats but it seems that the only human contact she has is with a guy in a dress who turns up to mock her loneliness. I hope she doesn’t turn into a crazy cat lady because there are strange, creative and fun elements to Sayoko’s quirky personality, like the unique way she eats somen noodles to the way she makes a large cat’s cradle in her house to hang her washing up on a rainy day. 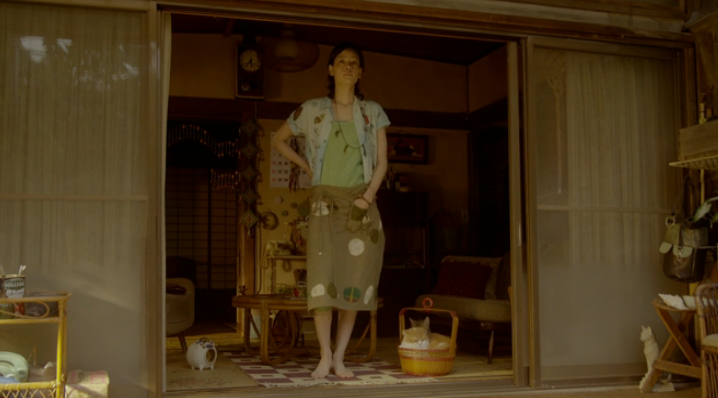 Ichikawa is a delight to watch. She is a bit of a tom-boy with unconventional looks but has an attractive personality which is equal parts kindness, devotion and endurance, not least shown in the way she treats her cats so well and there are a lot of cats, each with their own personality and quirks. While the loneliness of others is easily packaged up, Sayoko’s isn’t and her ending is very enigmatic. I prefer to read that she has moved on herself and found happiness. 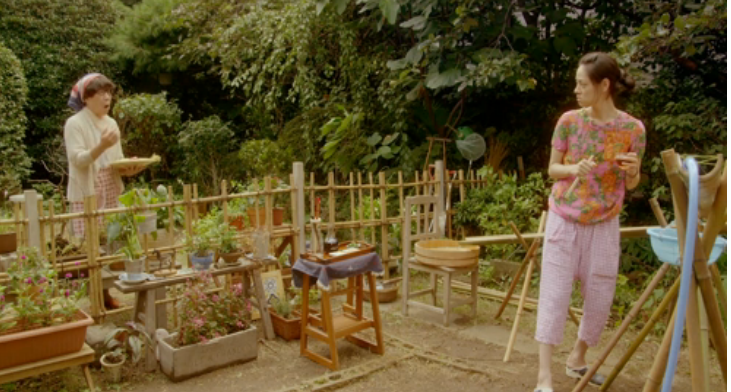 The film is definitely about the people and Ogigami’s direction focusses on them. Shot composition and camera placement help to deliver the emotions intended. Most of the shots are long takes and eye-level so we see the look of despondency over the neglect and worry they feel to the look joy on people’s faces when a feline friend enters their life. My personal favourites include some great shots to show Sayoko on the riverbank. And a great low-angle shot that shows her small house surrounded by tower blocks. The film is always pleasant to watch which further enhances its gentle atmosphere. Rent-a-Cat was entertaining and I am glad that I have finally watched it but what got me was that behind the gentle and relaxing pace, the wry and very dry comedy and strangeness was a kernel of human emotion, the loneliness that people can feel in contemporary society. The film is billed as a comedy but do not expect to be howling with laughter, more entertained and warmed by the film and maybe, a little emotional at points. 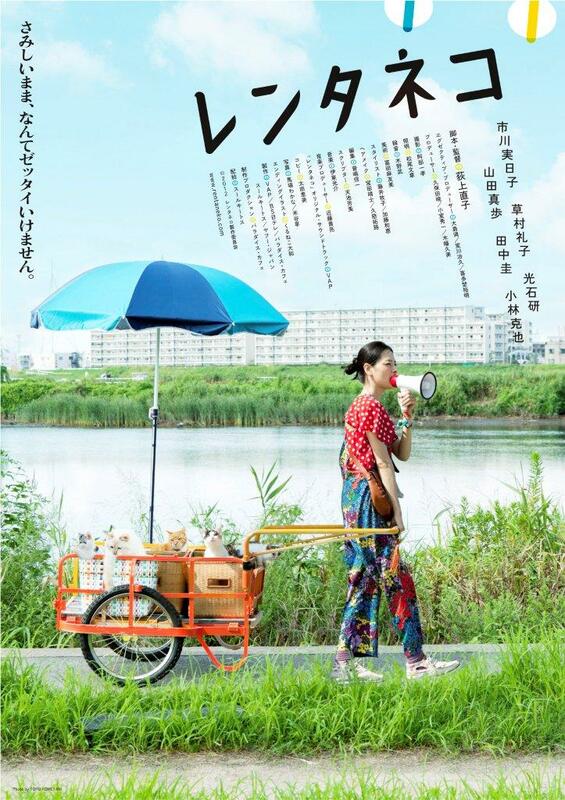 Ogigami, in probing loneliness, does not make a depressing film, more a gentle and low-key comedy. Other reviews from fellow Asian film bloggers include Alua‘s, MiB‘s, and SCUM Cinema‘s. I wanted to catch it before it disappeared from the Player since it has been on there for a long time. The film is entertaining and full of cats. Mikako Ichikawa is a fun actress – I have a priceless screencap from her “Deja vu” scene – and I’ll keep an eye out for titles in which she appears. Now, another film I watched on the player… Museum Hours… How on earth did that get a DVD release??? I’m trying not to be too negative with my review.